1. The Sun is only one of over 100 billion stars. 2. The sun is orbited by nine major planets: Mercury, Venus, Earth, Mars, Jupiter, Saturn, Uranus, Neptune, and Pluto (no longer an official planet). 3. The sun contains 99.85% of the mass in the solar system. 4. The sun is a medium-sized G2 star. A G star is cool (between 5,000-6,000 on the Kelvin temperature scale) and has a complex chemistry, which means its makeup includes chemicals heavier than helium. 5. Based on the average life of a G2 star, the present age of the sun is estimated to be 4.6 billion years, halfway through its lifetime. 6. 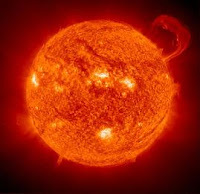 Four million tons of hydrogen are consumed by the sun every second, which helps to create the sun’s composition of 75 percent hydrogen, 23 percent helium, and 2 percent heavier elements. 7. The sun will continue to burn hydrogen collected in its core for another five billion years or so, and then helium will become its primary fuel. 8. Approximately 109 planet Earths would fit on the surface of the sun and more than one million planet Earths would fit inside of the sun. 10. Approximately every 11 years, the sun reverses its overall magnetic polarity: its north magnetic pole becomes a south pole, and vice versa. 11. The sun is the closest star to Earth and is 149.60 million kilometers (92.96 million miles) away. 12. At its core, the sun’s temperature is about 15 million degrees Celsius (about 27 million degrees Fahrenheit). 13. The sun rotates on its axis once every 25.38 Earth days or 609.12 hours. 14. 100,000,000,000 tons of dynamite would have to be detonated every second to match the energy produced by the sun. 15. A person weighing 150 pounds on Earth would weigh 4,200 pounds on the sun because the sun’s gravity is 28 times that of Earth. 16. The sun radiates heat and a steady stream of charged particles known as the solar wind, which blows about 280 miles (450 kilometers) per second throughout the solar system. 17. Solar flares are jets of particles that burst from the sun and can disrupt satellite communications and knock out electricity on Earth. 18. All planets orbit the sun in the same direction, counterclockwise, and on roughly the same plane, known as the ecliptic. 19. It takes only 8 minutes for sunlight to travel from the sun to the earth, which also means, if you see the sun go out, it actually went out 8 minutes ago. 20. The Sun revolves around our galaxy (the Milky Way) every 225 – 250 million years ( a galactic year).